A magical breadbox that delivers whatever you wish for—as long as it fits inside? It's too good to be true! Twelve-year-old Rebecca is struggling with her parents' separation, as well as a sudden move to her gran's house in another state. For a while, the magic bread box, discovered in the attic, makes life away from home a little easier. Then suddenly it starts to make things much, much more difficult, and Rebecca is forced to decide not just where, but who she really wants to be. Laurel Snyder's most thought-provoking book yet. The idea of a magic bread box was intriguing and really drew me into the story. But the story ended up going in a different direction than I expected. I liked the complications of the magic that Rebecca ended up having to deal with and her solutions. 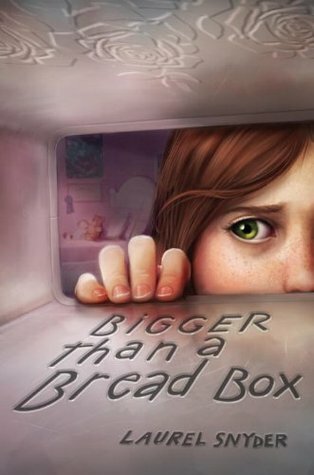 This is another a great book to have in the classroom, because of the family issues and the way Rebecca struggles in her relationships with friends and classmates. As a writer, I especially enjoyed the way the author used Rebecca’s memories and past experiences to help develop the story. Laurel Snyder lives in Atlanta, Georgia. She started writing in elementary school, when she and a friend made their own books with cardboard covers. For more info, visit Laurel Snyder’s website. Yes, yes! I loved this book. It's been a while since I read it, but I learned recently that there's a companion novel coming in January 2014. I've had this on my TBR list for a while. I read one of Laurel Snyder's other books--Any Which Wall--and really enjoyed it. I'll have to move this one up! Would you recommend this for reluctant readers? I have a 9 yr old daughter but she's a tough critic.